Volume III, Number 8 Published by Students of New College, Sarasota, Florida October 28, 1966 Inauguration Ceremonies For Inauguration ceremonies for President John Elmendorf will be held Feb. 22, 1967, in the courtyard of the Ringling Museum. Much like a national presidential inauguration, Elmendorf's inaugW'ation will be "a ritual to install the president, 11 according to Information Officer F=an ArthW'. There will be a procession, speeches, and other ceremony, :in eluding the "swearing-in" of the president. Sir Patrick Dean, British ambassador to the U. S., will be guest speaker. Arthur estimated "ar01.md 500011 people would be invited to the cere monies. "Several thousand are expected to attend, '1 he said. Aformal inauguration ball sponsored by the Women's Library Association for New College is scheduled for the night before in Hamilton Court. A special joint committee of trustees, faculty, and students has been charged with organizing the inauguration. Students on the committee were selected by Mike Cassell, chairman ofthe Student Executive Committee, with the SEC's approval. They are: Cassell, Dierdre Fennessy, JcrryNeugarten, Steve Nolgren, David Pini, Diana Shiphorst, and Devan Whiteside. Faculty members on the committee include Dr. Marion Hoppin, Dr. SEC Tables Move To Remove Limits On lntervisitation The Student Executive Committee tabled a motion Wednesday to remove the limits on the hours during which intervisitation is permitted. Introduced by Jeny N eugarten, after chairman Mike Cassell had indicated he would a motion to "delete sections B and C of rule three" (which limit the hours of intervisitation), the motion was seconded by ! )avid Pini. RachelFindley and Lee Crawfort moved almost immediately to table the motion "indefinitely." The motion totable was approved tman imously. The action followed lengthy discussion during which Pini rc ad a petition he said he and others had circulated and then withdrawn. The petition offered an alternative to the existing intervisitation rules. The complete text of the proposal follows: "We the undersigned endorse and will enforce the following proposed intcrvisitation rules; that there be hours of 10pm to ?am on weekdays and 12 mid. to ?am on Fri. and Sa:. nights for all girls rooms and no hours for boys rooms; that the proctor be dismissed and there be only a secW'ity guard; that furnished social rooms be set up immediately in the 2nd and 3rd courts; that the role of faculty residents in student affairs be rcexexamined; and tha: the following remark once again preface the New College student code "Consideration for others is the underlying philosophyoflife at New College." Jon Shaughnessy said about the proposal, "A lot of students say they want this rule because they don't think it will be enforced and without a proctor there would be nothing to worry about. 11 her there is the thought that we would do something next week. 11 Cassell said the concept of an administrative rule and a student rule was"alittleclouded" bywhatMil ler h=>d saic:l. fiE> tf\lrl thE' Cf\TT>lT)it tee, "All the rules we have to do with are student rules. Cassell said, "One or two of them were kind of forced on us bythe admin istration," SEC Okays Commi t tees The Student Executive Committee approved Wednesday the appointment of members named to student committees by SEC chairman Mike Cassell. All appointments made by Cassell were approved by the committee without obJection. The chairman told the committee, "practically all committees were appointed on the recommendation of the chairmen. Named to the Academic Committee were John Cranor, chairman; Kay Moller, David Pini, Rachel Findley, Joan Schnabel, Irving Benoist, Jerry Michaels and David Tekler. Tentatively appointed to the (Continued on page 3, column 1) George Petrie, Herb Stoddard, and Paul Wolfe. Trustees on the committee are Mrs, A. Wer'r< Cook, Mrs. William B. Kip, and Robert B. Van Skike, Jr. Van Skike heads the committee. Mrs. Adrian Swift has been appointed special administrative coordinator to assist him. Also, Dr. Arthur Borden, chairman of the Humanities, has been designated the faculty marshall and will lead the faculty procession at the inauguration. The guest list for the inauguration includes people from various educational institutions, learned societies, foundations, the government, etc. in this country and abroad. Advance notices to these people are in the process of being sent out, Arthur said. Formal invitations will follow. Arthur noted that schools must plan a year or more ahead of time in arranging a ceremony like the inauguration. This will be New College's first official presidential inauguration ceremony. Elmendorf was appointed president July 16, 1965. College To Hire The college has taken steps to dismiss the Wackenhut Company as proctor for the east campus and to rehire Bob Ritchie. Planning Officer Ralph Styles said last night "the SEC has recommended (a change in proctors) and Ritchie steps arc being taken to do it." He said, "Negotiations are tmdenvay." Sty lcs said the move had been approved by President Jolm Elmendorf and Dean of Students Robert Norwine. He indicated he hopes the change will be effective by the middle of the week. Objections to various aspects of the W ackhenhut proctor operation have been voiced lately from several quarters. A student complaint President Scheduled E l mendorf Takes Steps New Proctor was brought before the SEC last week. Assistant Dean Arthur Miller told the SEC at the same meeting, "We have been in considerable trouble with the proctor situation. He pointed out the weekend changes whichhadt:ken place and the propensity of the weekend proctor for sleeping and staying in the television room. Also at the same meeting, the SEC adopted a motion to urge the administration to "seriously consider Ritchie's application" for the job. At that time Miller reported Styles was considering the action but said he (Miller) was tmsure of the official level of consideration of Ritchie's return. The SEC discussed the situation Wednesday and some interest was expressed both in having Ritchie return and in keeping James MW' phy, the present week-night proctor. A motion by first-year representative Jon Shaughnessy "that whatever questions we do ask (of the administration about the situation be asked with the idea that we don't keep Murphy and get Ritchie. 11 The motion was seconded and tabled. The meeting reached a consensus to recommend to Styles that Ritchie be hired as the canpus proctor and Murphy be retained also, if possible. Rehearsal Set; Forums Planned New College's "band" will rehearse tonight after dinner in the Music Room. There will be no forum. The group will perform Nov. 11 atthe Allied Arts Council program in Sarasota Municipal Auditorimn. Students are we 1 com e to attend the rehearsal. Other forums scheduled for the Assistant Dean Arthur Miller had earlier explained to the members of the committee his "present tm derstanding" of the situation regarding intervisitation. He said President John Elmendorf is "willing to listen to proposals for changing the rules." Grad School Accepts NC Student next few weeks include: Architect Sheldon Peed, of I M, Pei and Associates, who will speak on the development of the cast campus Nov. 4; author and playwright Borden Deal who will talk briefly about one of his own literary theories and then invite discussion on Nov. 11; and the New Co 11 e g e Choral Soc.icly which vlill present its first program Nov. 18. Miller said the proper course for such a proposal to follow was from the SEC to the College Cotmcil and then to the administration. The "main action" in the proposal for change, he said, was to Dean of Students Robert Norwine. If and when such a change in the rules were to be fotmd acceptable, he continued, the change would be postulated as an administration rule. The reasons for this, Miller said "m;v not be readily apparent but it would help to stabilize the situation. "The administration certainly is willingto listen to any reasonable proposal," Miller said. He warned, "There are some harebrained schemes floating arotmd. Mter Miller spoke, Cassell said, is feeling 011 the o! some administration officials that we should wait until next term (to act on intervisitation) bl.U. on the part oil one administration mcm-Biology maJOr David Hartley, first stu.dent torece.ive an notice from a grad school, works on h1s semor proJect m the science lab. He is attempting to isolate and cultivate the bacteria that live in ter mites' stomachs and act on cellulose, enabling the hosts to "eat" wood. The first letter of accejJtance for a New College student from a graduate school was received last week bypre-medstudent David Hartley. 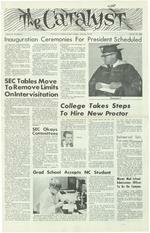 Duke University potified Hartley of its decision to accept him for the fall '67 term Friday. On Monday, Hartley received an acceptance letter from the University of Colorado. He is the only New College student to have been accepted by a graduate school so far. Hartley noted last night he still must seek and obtain financial aid if he is to attend either of the schools. He said he has applied at five other schools, from which he has yet received no word. In addition to being accepted at Duke, Hartley has been notified he is being considered there for its combined-degree program, under which .1 student gains both his M.D. and his Ph. D. in s1x to seven years instead of the usual eight. Miami Med School Admissions Officer To Be On Camp1s Dr. George T. Lewis, chairm:1n of the Committee on Admissions of the Univenity of Miami School of Medicine, will be on c:1mpus Thursday to counsel students on medical school :1dmissions requirements. According to Natura.! Sciences Chairman, Dr. Peter Burl, students who are interested in any medic;tl school should ta.ke this opportunity to talk with Lewis. He will be av:1ibble after 1:30 pm in RoomSAofthe N:1tur:1l Sciences Laboratory. Interested students should make :1n appointment with the N:1tural Sciences secretary, extension 57. 4 j ..
October 28, 1966 The Catalyst Page 3 Faculty Nominates Six for Fellowships Kezar Findley SEC Okays (Continued from page one) Committee were KenJi Oda, chairman; Ann Chandler, Ellen Tisdale, Steve Orlofsky and Rick Stauffer. The appointments were temporary because the number students app:>inted exceeded the number established for the com mittee. Karle Prendergast wa:.. rena:ned ! :o comniiiee. Othc members are Kenji Oda, Bobbie Luther, John O'Neil, Beth Crosby and Steve Knowles. The Student Activity Fund Committee was also named tentatively because too many students were nominated. Those named were Kenny Misemer, chairman; Carol Worby, Harry Felder, Lee Crawfort, Derdre Fennesy, Drew Douglas and Janis Wolak, Named to the Supervisory Committee were Katie Smith, chairman; Steve Orlofsky and Nancy Redick. Jerry Neugarten and Jon Shaughnessy were named to the Financial Investigation Committee. In other business the Food Committee reported to the SEC Thomas Estep, managing chef, expressed his thanks to the students for the return of s i 1 v e r w are, pitchers, plates and other items which had been missing from the kitchen. Estep was also reported appreciative because the amount of food wasted had been reduced 'ta great deal. 11 A request by the Social C<.>mmit tee for $160 for tomoiTOw1s dance was also approved by the SEC. It has previously been approved by the Student Activity Fund Committee. Olsen The faculty has nominated four graduating students for Rhodes Scholarships and two for Danforth fellowships. President Jolm Elmendorf announced yesterday the nomination of PaulHansma, Neil Olsen, Dennis Kezar and "Olarles Raebum for Rhodes Scholarships. Rachel Findley and Ray Enslow were nominated for the Danforth awards. Danforth Graduate Fellowships are awarded to students with "interest in preparation for a career in college teaching. 11 Rhodes Scholarships are awarded for study at Oxford University in a variety of fields. Atotalof 32 Rhodes Scholarships are awarded annually in the United States. The award consists of payment of fees to the scholar's college plus a maintenance allowance of +.720 per year for a minimum of of two years and a maximum of three years, Approximately 120Danforth Fellowships are awarded each year in amounts up to $1800 depending on need. The awards are normally renewable for a total of four years of study. Rhodes Scholars will be elected in December and Danforth Fellows will be notified March 15, 1967. Raeburn Hansma Enslow Accreditation Team To Visit Next Week Rabbi Herbert: J. Weiss, center, of Temple Emanu-el, representing the Jewish Chautauqua Society, recently presented 36 books of Hebraica material to the New College library. At the presentation were, 1. to r. : James DeJarnatt, asst. librarian; Pres. Jolm Elmendorf; Weiss; Ralph Wolman, president, Temple Emanuel men's cltlb; Arthur Weiser, vice president of the men's cltro. UC Students Reject Curfew The president af the University of Oticago's Student Government (SG) last month called curfew regulations for freshman and sophomorewomen "a sop for an ignorant public" and called for their aboli-tion. "Women1shourswill be abolislled effective the beginning o f winter quarter," the Chicago Maroon quo tedSGheadTomHeagy as vowing. An accreditation team from the Southern Association of Colleges and s.chools (SACS) will inspect New College as part of the process of conSldering the college's application for the status of candidate for membership in SACS. The three-man committee will arrive Wednesday afternoon and remain on campus until Friday, according to Graduate Placement 0 ff ice r Earl Helgeson. He said w hi 1 e they are here committee members will talk with members of the faculty, the administration and students in addition to other activities. Chairman of the committee is Dr. Alfred Neumann, Dean of the University of Houston. The other two members are Dr. Fred Conner, Vice President of the University of Florida, and Dr. Charles Vail, Associate Executive Secretary, Commission on Colleges, Southern Association of Colleges and Schools. Helgeson termed the process of applying for status of candidate for membership an "early recognition procedure. If New Co 11 e g e is granted this status, he said, it can "get the process of accreditation underway while the time requirement (for accreditation) is elapsing. 11 U-n de r the rules of the SACS a college must graduate two classes before it can apply forfull accreditation, Helgeson said. Part of the requirements for full accreditation is an intensive selfstudy by the college which will require from 12 to 18 months to complete. If it is gr.mted the status of candidate for membership, it can initiate this study during the period it is graduating the required two classes. According to Helgeson, the "ear liest New College could possibly have full accreditation would be 1969." If the college is granted its candidate status, accreditation would be retroactive to include the first two classes to graduate. Favorable Replies From Grad Schools Reach Total of 31 Rejecting arguments that first and second year women are not sufficiently m at ur e to regulate their own lives as "nothing but a vestige of the Victorian double standard," Heagy warned that unleS'> the administration abolishes hours, SG would "unilaterally" do so. There are no curfew restrictions on male students or female upper classmen. (lntervisitation, however, is allowed only from 4 pm to 1 am on Friday, 1 pm to 1 am on Saturday, and 1 pm to 10 pm on Sunday, "a net increase of 14 hours over last year." A total of 31 graduate schools have now indicated their willingness to consider New College students without prejudice even though the college is not yet accredited. Replies have been coming in steadily for the last two weeks and Graduate Placement Officer Earl Helgeson expects many more in the near Heagy c ailed for every 1mderclass woman to commit "a major viola tion" of the curfew hours during the first two weeks of the winter quarter. future. Altogether he has contacted 100 schools. Fourschools have responded with so m e question about considering New College graduates. Two of these, UCLA and the State Univer sity of New York at Albany, allow admissions committees to pass on graduates :.md any deferment of requirements on accreditation must come from them. Of the other two, the University of Arizona asked how the Univer sity of Florida regarded New College, apparently to judge accord in g 1 y The University of West Virginia ind1cated it would reserve decision tmtil after the accrediting team has visited New College next month. Those schools w h i c h have said they will consider New College graduates without prejudice in-Tired of Patronizing Waiters? EAT at COLLEGE HALL Senamation Mathias elude: Columbia, Harvard, Uni versity of Chicago, Cornell, Stan ford, Princeton, University of Florida, Duke, North Carolina at Chapel Hill, University of Pennsylvania, Brown; Tufts, University of Connecticut, University of Massachusetts, Calif o r n i a Institute of Technology, Johns Hopkins, Western Reserve, D r e x e 1 Institute of T eclmology, Massachusetts Institute of Teclmo logy, Rice University, University of Hawaii, University of Pittsburgh, Smith and the University of New Mexico. The Yale Law School has also indicated it will consider graduates as have six medical schools: Jolms Hopkins, Stanford, Albert Einstein, Yale, Duke and the University of Colorado. He suggested that at the end of two weeks they commit a second violation by attending a gala party, sponsored by the SG, "which will double as a victory party. 11 Auto Motor Scooter Liability & Collision Pay as you drive Jack Zickafoose Insurance Agency Bayshore Gardens Shopping Center 755-5349 REFRESHMENT PAVIUJOH OF THE RINQJNG MUSEUM GROUNDS Sandwiches-Snacks Open Monday Saturday: 9 <4:30 Sunday: I <4:30 Despite the factthatthe kitchen staffhasbegun to plan forThanksgiving dinner in College Hall, Planning Officer Ralph Styles said yesterday he is "still hopeful" that the new dining hall will be ready for the holiday. Above, the dining complex is viewed from the northwest. Oneys 5& 10 Household and School Supplies 3520 H. Trail ED'S BSO SERVICE Complimentary gift with your first tank of gas u.s. 41 Nellt te Trd .... The .7.earLook fo:, 1=' eopl Ewho svvorc r D&y wu u ld never buy another o!le. Page 4 on cam us with Laurie Pau/so11 The Catalyst October 28, 1966 GOODWIN'S NORTH TRAIL ESSO Across f r om t h e Angu' Inn Valleys of K nowing American and Foreign Car Repairs In New Jersey, where I come from, the towns follow one another like the cars of a train, and any little wilderness that's left they've parceled into parks 1h at are crowded on Sl.Dldays. It's not the same in Florida, exactly, but it'snot so different either. The endless trailer parks resemble trains more than metaphorically, and the wil derness has to be sought after. So you begin worrying about the population explosion, and 'wondering what it will be like in fifty years. America will be one vast city, you think and we'll die like flies from lack of space and air. But I fol.Dld that in Wyoming, the little towus are sixty miles apart, and b e t w e e n tllem are hills of brown, broken earth which the wind molds, cruelly digging useless furrows, destroying and building the futile grol.Dld. stral}ge Paulson _.; yellow hills of South a, wild pheasant are the only life that cross the careful highway. The towns send out their signals for miles--the insurance brokers and .automobile agencies and motels and restaurants and you wait for them, and the towns come and you wonder if there shouldn't be something more--if this can really be all, if this can be all, if this can be where people are bom and live and die. But there's nothing more, and there have been many, many lives in the few dusty streets. I believed you could always learn about a place, when you were away from it. That the new people and things and attitudes would tell you about the ones you left--the more familiarones--ifonlyby their difference. Butitseemedthatmthing spoke of New College, of Sarasota, of anything but the vastness and the prairie grass and, much far t h e r nolth, the melting glacial remnants hidden in the secret places of the mo\.Dlt ains. I couldn't even im ag ine'c o u l d n 1 t conceive of the warmth and the flatness and the silly, fragil e palm trees there, couldn't imagine people attending a college, doing the things they did, even talking together, as I stood on the hilltop, the sky embraced by the pine trees, the other mol.Dltains far away, the quietness except for t h e insects stirring in the hilltop grass, and the wind. !couldn't believe there was anything like a New College in the world, and I had been dreaming to think so. But this, 1 should have known, was the most important discovery of all. There was one town in its dusty valley, cold and windy and rain!ng in August, and I walked its one main street late at night, and even the air seemed different, was something I'd never known before. It was cold and l wasn t prepared for it, and I walked close to the s ides of the buildings. The side streets were short, with a few houses, small frame boxes, on each, and then the l.Dlpaved streets met the sides of the yellow hills, and had to stop. I paid little attentinn tothe stores I passed, wanted only to reach the end of the street and FOR SEAFOOD Your (hoi'e of 67 menu spe, i alties Lun'h and d i nner ev ery day 1 4 Conveni ent Lo,at ions S orosoto-7230 N. T omiomi Trail Sarasota-3550 Fruitville R o a d St. Petersburg-1500 P asadena Ave. S. Also in Perrine, Coral Gobles, Miami, North Miami, Donia Ft. lauderdale, Pompano Beach, Boca Rolon, West Palm Beach, North Palm Bea c h come back, as if imposing some intention on the evening. At a comer I turned arotmd to a v.vid a gust of wind that was far too invincible for my windbreaker. There was a real estate office there, though it sold other things, li. }l:e insurance and fuel, to the people of the town. I looked at the pictures in the window--of houses for sale, of comprehensive p 1 an s for the orotPct;on of thP. whnlP f,.,..,ihr .,,. a lighted clock, slightly wrong, and l realized there was a lUe here, a world as valid as any other, that I could never tmderst and. There was a texture to the days even in this inhospit 1ble valley. There were joys and sadness, and pain, and days when pain and sadness didn' t matter. I couldn' t live here-Icouldn 1t know this place as if it were an other home--1 couldn't greet its people as I passed them in the street on a bright winter' s m orning when the previous night's gigantic snow made life a great private joke we all shared. I couldn;t know this place1 and it saddened me. The Galaxies will provide musical entertainment at the dance. P"i' :w :t :t today! Dance Tickets on Sale Now PALMER1S STEAK HOUSE We !